I feel like I am constantly talking about Moab, but there’s a reason for that. Moab, Utah is Mecca for Wheelers. Whether you are on two wheels or four doesn’t seem to matter here. Early in April, we got to attend Easter Jeep Safari. EJS is sponsored by the Red Rock 4Wheelers and they host trail rides on over 25 different trails throughout the area. Add to that beautiful National Parks, what is not to love about Moab. We had two weeks to spend there this year, so I got a job while I was there. I love business, any and all kinds, and was fortunate to get a few days to spend at the T-Shirt Shop. Dottie Byrd has a place that has thousands of designs and you get to put together your own shirts. I spent my time stocking shelves and organizing designs. The number one thing I learned about the business is that organization is key, if you can’t find it, you can’t sell it. The T-Shirt Shop is one of those places that runs on the sheer energy and determination of it’s owner. It was a pleasure to meet someone so enthusiastic about a business she has already been in for 30 years. We had to make a quick run to Moab this week and took the time to go up to the Sunset Grill for dinner. It was our first date night in awhile. The Sunset Grill is perched on the top of a ridge overlooking all of Moab and the Red Rocks to the West. I assumed since the view was awesome the food would be mediocre. I was wrong, in a big way. The food was as delicious as the view. Wild mushroom appetizer, crabmeat and shrimp linguine, creme brulee for dessert – not one of them was disappointing. Make the trek up the sidehill for the meal, even if you miss the sunset, it is worth it! I used to give my mom a hard time about reading James Michener novels, while I enjoyed the story, it made me crazy that he always started with the formation of the earth. I figured if I started a third of the way in, I might get to skip that part. Now, I have found, when you travel, those things come to mind. Four Corners in the Southwest is the spot where you can stand to be in four states at one time, Arizona, New Mexico, Colorado and Utah. The Four Corners area has some fascinating rock structures, pinnacles that reach high in to the air with no apparent notice leading up to them. These aren’t rock ledges, these are just rocks. Shiprock truly stands in the middle of the desert like a ship on the horizon. Others of less fame stand as lone sentinels. The desert surrounds for as far as the eye can see. 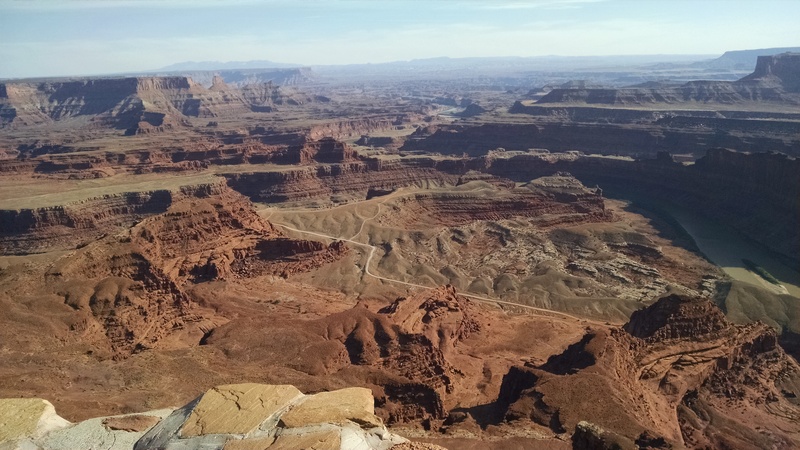 If you continue traveling north through Cortez and Dove Creek, Colorado and follow the road up through Monticello and Moab, you are treated to magnificent views and two National Parks. Canyonlands on the south end of Moab and Arches on the North. Incredible views set aside for all of us to enjoy. I’m a big fan of National Parks, H & I spent a summer traveling and visited 17 of them in 30 days – but that’s another story. From our perspective, Moab is the motherland. It is home to some of the best wheeling anywhere. As we drive through, Big points out the road to BFE, on the right is Upper Proving Grounds, his favorite, is southwest of Moab, a place called Pritchett Canyon. He regularly talks about his runs there. There is a huge push in Utah to keep trails open and find a way for everyone to share the trails. Through the efforts of our friend,Tacoma, and many others with the Utah 4 Wheel Drive Association and local clubs like the Red Rock Wheelers, they are being successful. This is a group effort and takes everyone, I don’t mean to diminish the part of anyone involved, your help is invaluable. So Utahans, keep up the good work, with our thanks. There are two things I love about Utah– the dramatic landscapes and the names of the towns. Wherever you are, in Utah, gives you dramatic landscapes. From the northern orchards to the southern red rock; along the Wasatch to the Bonneville Salt Flats. There is so much to see. If I were a true photographer, instead of a point and shoot girl, I could spend days roaming the landscapes. But, since I’m not, I didn’t add any photos, I couldn’t begin to do it justice. When you enter Utah from the North on the I-15, the rolling hills look a lot like Idaho, but because you drop elevation in to the valley, there are orchards as far as the eye can see. I love stopping at the roadside vendors during the summer months to pick up fresh Utah peaches and cherries. Breaking in to the Salt Lake valley, brings you along side the Wasatch mountains. The high peaks that all the mountain ski resorts are based in. You can go farther east to the Park City area to see the Wasatch from the other side, but I prefer the West side. When the sun rises it highlights the mountain first, before breaking over, since they run almost directly North/South.. The West side of Utah along I-80 is dramatic for its’ lack of scenery. You can see mountains in the distance, but the Bonneville Salt Flats offer a unique perspective of what the land under the Great Salt Lake probably looks like. There are salt deposits covering the ground and along the freeway you can see where people have stacked rocks to make their mark along the road. Someday, I’m going to do that. Red rocks can be found all over the southern and south-eastern part of the state. St. George and Moab are two of the most famous areas for that, very dramatic under any light. Some of my favorite area, though, is south of Provo to Hurricane. That’s where the sage brush and the rock are. Lots of canyons and rocks, places where the river washes and creek beds flow, even when the water doesn’t. Beautiful county, full of wildlife, but not many people. The second thing I love about Utah are the names of the towns. Places like Parawan and Panguitch, Scipio and Moab, Escalante and Toquerville, all roll off the tongue with great finesse. It feels foreign, and yet domestic. Tooele is my favorite for trying to figure out how to pronounce it. If someone was sending you to Tooele, wouldn’t you want to spell it Tuwella?